Part restaurant empire-builder, part celebrity, and part sublimely talented chef, Gordon Ramsay is a truly global star in the cooking world. It all could have been all so different though…. Scottish by birth, Gordon Ramsay was raised in England after his parents moved south to Stratford-upon-Avon. His first career break came while playing football for Oxford United where he was spotted by a Glasgow Rangers scout in a F.A. youth club match. After completing trials he was signed by the Scottish champions at the age of 15. Three years later he had given up professional football and gone back to college to complete a course in hotel management. Ramsay moved to London, where he joined Marco Pierre White in the early days of Harvey’s in Wandsworth. After a couple of years Ramsay’s moved to Le Gavroche to work alongside Albert Roux. This was followed by three years of working in France in the kitchens of Guy Savoy and Joël Robuchon. In October 1993, Ramsay became chef of the newly opened Aubergine, where he won many accolades, including two Michelin stars within three years of opening. Ramsay’s first book, “Passion for Flavour,” was published in October 1996. His second book,”Passion for Seafood,” was published in May 1999. “A Chef for all Seasons” was published in September 2000, followed by “Just Desserts” in September 2001 and “Secrets” in 2003. In 1998 at the age of 31, Ramsay set up his first wholly owned restaurant, Gordon Ramsay, on the former site of La Tante Claire in Chelsea. A year later he opened Pétrus with his protegé Marcus Wareing as Chef Patron, in St. James’s. Within seven months it had won a Michelin star. In October 2001 Gordon opened Gordon Ramsay at Claridges which gained a Michelin star in 2003. In June 2000 Ramsay won The Chef of the Year Award at the Cateys. His restaurant Gordon Ramsay was voted the Top Restaurant in the U.K. with a score of 28 in the 2001 London Zagat Survey, and was also named as the best Fine Dining Restaurant in the 2001 Harden’s Guide. These ratings continued in 2002, 2003, 2004 and 2005. On January 19, 2001, the original Gordon Ramsay restaurant gained its third Michelin star in the Great Britain & Ireland Red Guide. Gordon Ramsay Holdings Limited took over the whole of the food and beverage operation at The Connaught Hotel in October 2002 and installed chef Angela Hartnett whose restaurant MENU won its first Michelin star In January 2004. In 2003 Gordon Ramsay Holdings re-launched The Savoy Grill with Marcus Wareing. The restaurant achieved its first Michelin star in 2004. This was followed with the opening of Boxwood Café at The Berkeley alongside the Michelin star Pétrus, which had moved from St. James’s. Finally, Banquette launched at The Savoy in December 2003. In May 2004, Ramsay headed “Ramsay’s Kitchen Nightmares,” a series of four one-hour programs, which was awarded a BAFTA (British Academy of Film and Television Arts). 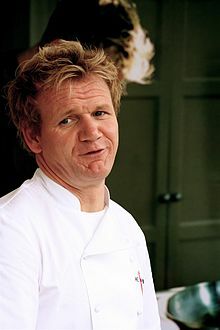 The show which saw Ramsay attempt to rescue restaurants around the country in need of immediate assistance, was launched simultaneously with Ramsay’s recipe book “Gordon Ramsay Kitchen Heaven.” This was followed by ITV’s “Hell’s Kitchen,” where Ramsay was given two weeks to train celebrities into Michelin-star chefs. 2005 saw a second series of “Ramsay’s Kitchen Nightmares” followed by the very successful version of “HELL’S KITCHEN USA”. Ramsay also starred in “The F-Word,” a high-octane food show in which the action was set against the backdrop of a full working kitchen. Over the course of the show, Ramsay and his brigade prepared a three-course meal for diners. Ramsay’s sixth book, “Gordon Ramsay Makes it Easy,” came out in May 2005. Ramsay also launched his eighth restaurant, MAZE, in London’s Grosvenor Square alongside Head Chef Jason Atherton. Winner of a host of awards, the acclaimed restaurant offers a flexible menu focusing on French Cuisine with Asian influences. In July 2005, Ramsay opened his first restaurant in Japan at The Conrad Tokyo, the city’s newest luxury hotel with Head Chef Andrew Cook heading the kitchen. Topping off an extraordinary year, Ramsay was awarded an OBE (Order of the British Empire) in the New Year’s Honours list.